1. An elegant silk paisley bow tie in aubergine, $24.95, pairs effortlessly with Tallia’s cotton blended socks, $9.95, from Friar Tux (multiple locations). A blushing bride protea is the star of this boutonnière with scented rosemary and lycopodium, $15, from Flower Duet in Los Angeles. 2. 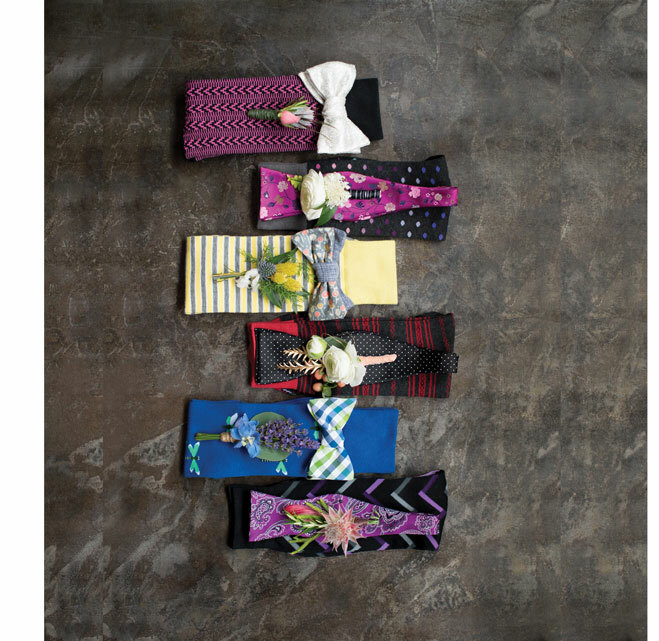 Pep it up with a green and blue madras bow tie, $22, from Grunion Run in Los Angeles; luxe over-the-calf Tommy John socks emblazoned with delicate dragonflies, $16, at Nordstrom; and a lavender, delphinium and eucalyptus-accented boutonnière, $20, from Flowers by Cina. 3. The Tie Bar’s classic black and white-dotted “Rivington” bow tie pairs perfectly with Hook and Albert’s chic red and gray patterned socks, $19, at Nordstrom. Add color contrast with a white ranunculus boutonnière with nestling peach hypericum, grevillea and silver dollar eucalyptus, $15, from Flowers by Cina in Garden Grove. 4. This handmade gray bow tie boasts apricot and gold florals on a blue background, $44, from ZB Savoy Bowtie Co. in San Diego, while Tommy John’s “Mikee” ultimate stay-up dress sock (boasting InvisiGrip technology to avoid slippage) in yellow cream and gray adds a sunny vibe, $16, at Nordstrom. Round out this crisp look with a boutonnière of blue thistle, dyed and dried clover, and Italian ruscus, $18, from Foxtail Florals in Orange County. 5. The sharp-dressed groom will rock this poppy pink floral silk tie, $24.95, from Friar Tux, paired with Hook and Albert’s polka-dot “Individual” dress socks, $30, at Nordstrom. Finish the lapel with a white ranunculus and scabiosa boutonnière sporting sprigs of sword fern and Italian ruscus, and wrapped with a sheer, black pinstripe ribbon, $22, from Lotus and Lily in Studio City. 6. Make an eye-catching statement in pink and black zigzag Individual dress socks, $30, matched with a reversible butterfly bow tie featuring an ivory metallic-painted canvas with elegant satin on the flip side, $105, both online at Hook and Albert. A pink spray rose boutonnière supports a gray-hued succulent rosette accented with rosemary sprigs and peacock feathers, $15, from Flower Duet in Los Angeles.